My July 2009 newsletter is now available. This post won't be for everyone - but don't worry, I'm not going to include any pictures that might offend anyone. (And the clickable links all take you to non-offensive pages, too.) But I swear this was a real question I got recently, and I thought it was worth an answer. The authors at mypleasure.com/features/bulletins/9.asp have this good advice about whatever storage product you use: Rule Number One: Keep it in Reach of the Bed. We always want to store frequently-used items near where they will be used, and the adult toys are no exception. You certainly don't need any specifically-for-the-toys storage. 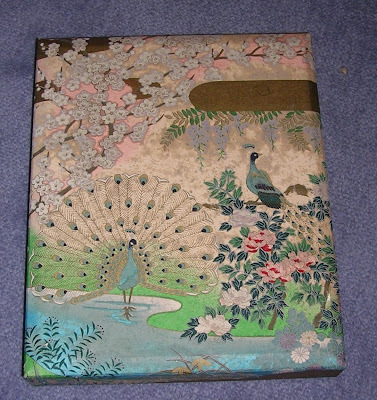 Many readers at mypleasure.com use a simple shoe box, often kept under the bed. And for those not offended by pictures of such toys, take a look at homemade-six-toys.com/organize/index.html. (But change the vowel in the word six - I'm trying to make sure this post gets through to those receiving it by e-mail.) The author shows how various organizing products - a tool belt, tackle box, and more - can be used for the toys. Depending on your sense of humor, you might find this hilarious - especially the spice rack. But if you want something specifically for the toys, there are some nice products that don't scream "adult toys in here!" For example, see the adult toy box at the top of this post - and note the lock. This is one of the many options at DevineToys. Another fine option are the products from ToiBocks. 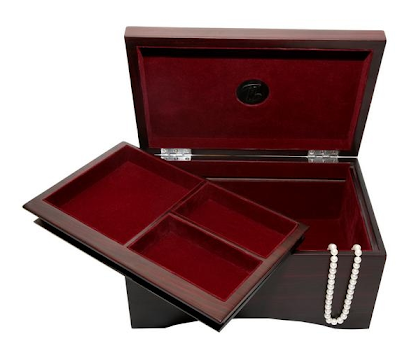 There's a "jewelry box" which has an upper tray - which only lifts out (to allow access to the toys) if you know the secret to the hidden lock mechanism. Update on Dec. 22, 2013: ToiBocks is no longer in business, but some sites may still have its products for sale. 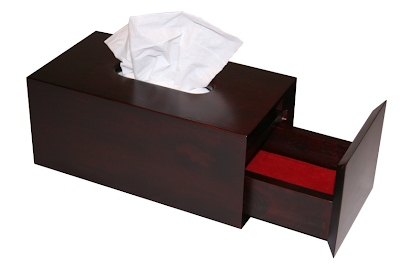 And there's also the "tissue box" shown above - with no lock, but who would think that this is actually a storage container? The reader asking about glass storage also pointed me to the recent column by Nicholas Kristof of The New York Times - yet another piece which addresses the possible problems of phthalates. I wrote about the concerns surrounding plastic food storage - and your various storage alternatives - back in May, but I've got some updates to share. First of all, Lorraine Thompson has an interesting post where she lists six reasons why glass food containers are better than plastic - from the safety side, to beauty, to flavor. If you want to buy glass food storage with glass lids, your choices are indeed quite limited; Anchor Hocking is still a good choice. Here's an Australian site that sells the Anchor Hocking containers. There are 2-cup, 5-cup, and 12-cup options. You can find them on Amazon.com, too, in all three sizes. (A number of other places also sell them.) The containers shown at the top of this post are from Anchor Hocking. Update on July 20, 2011: The Australian site I originally listed no longer sells the Anchor Hocking storage. The Container Store still has glass storage with glass lids, too. There's a 2-cup and a 12-cup option. They look a lot like the Anchor Hocking ones. And I just discovered are a few Martha Stewart products at Target which seem to have glass lids. There's a 5-cup version; the 2-cup version says it has a plastic lid, but it sure looks like a glass lid in the photo, and the customer reviews says "no plastic parts." These are both on sale, and the prices say "while supplies last." (There's also a 3-quart option, but it's out of stock.) 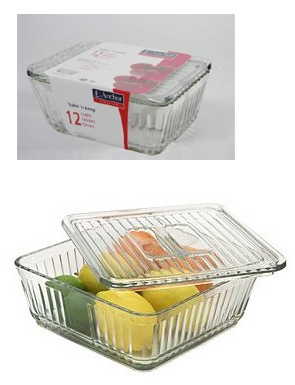 These also look very similar to the Anchor Hocking products. Update on Oct. 7, 2010: I'm no longer finding these Martha Stewart products at Target, but I see some at Macy's. Can you imagine working through a 1,277-item to-do list in a year - a list with items like "clean self-cleaning oven" and "be nicer to wife" and "find marriage certificate"? 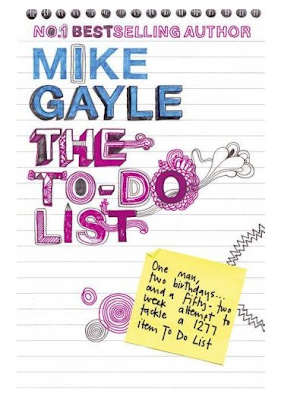 Mike Gayle decided it was time he became "a proper adult" and created his list of things to do between one birthday and another. The To-Do List tells us about his experiences. I found the most interesting parts to be those involving others - when he re-connects with old friends, for example, or when he does something very special for his mother. - Unpack box marked "loft" still unpacked from our house move 6 years ago. - Unpack box marked "shed" still unpacked from our house move 6 years ago. - Unpack box marked "stuff" still unpacked from our house move 6 years ago. - And the year 96/95. - Use up all the mini bottles of toiletries you insist on liberating from hotel bathrooms. - Find out what the dozen or so random keys in the key drawer actually open. And there are some funny organizing-related stories - including the time where the list itself got misplaced and was presumed lost for good. One story we do get in full is how item #943 gets handled - the item which reads "Find the instruction manuals for the video recorder and the DVD player and work out how to put the correct time on the clocks because they've been telling the wrong time now for five and a half years." The DVD manual is eventually found, but the video player manual is nowhere to be found. But there's still a happy ending. "Problem solved. Have given away our video player to John and Charlotte." 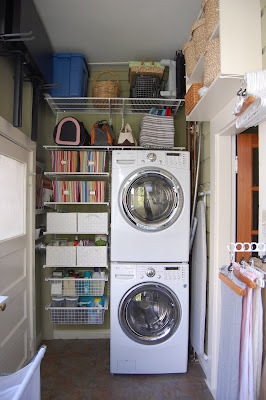 Laundry Room Re-Do - Done! 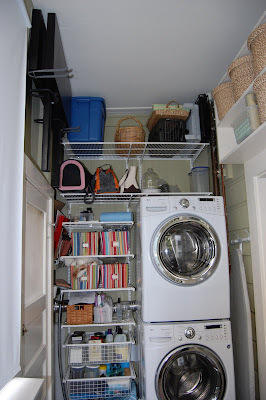 A few days ago, Cynthia wrote for advice regarding her laundry room, and a number of you (along with me) provided suggestions. Now she's made her changes, and here's what she has to say: "Even though it's not as dramatic as an HGTV episode, I'm happy and the space is working much better now. I think I hit a good combination of looking better and working better." And this raises some good points. First off, most organizing projects don't work like the TV shows. We don't have huge staffs working behind the scenes, we don't work 18-hour days, and we have limited budgets - and limited time. And while TV shows focus on huge changes, many of our projects are smaller-scale, and involve tweaks to existing systems, not total re-dos. Little things can make a big difference in how a space works, and feels. Cynthia's space is more functional now and, she says, "the space looks nice and doesn't bug me when I walk through the room." That's success! To read more about what Cynthia did, you can read her own blog entry. - They don't get mouldy in our damp coastal environment. - They don't cave in on the top. - They can remind you fondly of their original contents. 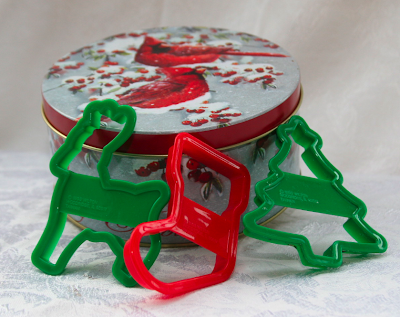 She also notes that Christmas tins are great for storing Christmas lights, cards, stickers, and cookie cutters. 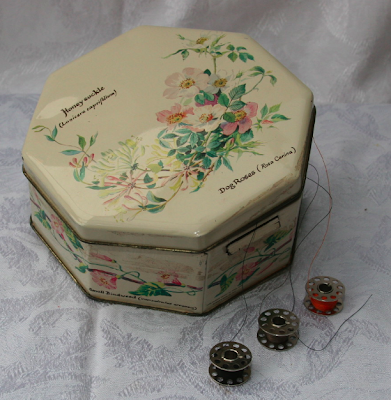 Surrey kindly sent me photos of her tins; these are just three of the twelve. Anyone else have some favorite storage you'd like to share? Send me an e-mail and include some photos. If you're going to use a box to hold stuff you use frequently - and maybe even have the box sitting out, rather than tucked away - why not have the box be beautiful? The one above is my own, from Miki's Paper in Berkeley, California. The last time I looked, the store no longer carried these boxes - but you can find lovely boxes a number of other places. 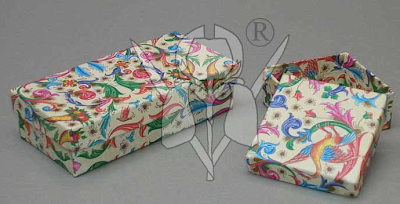 I loved the handmade paper I saw in Venice, and now I've discovered the lovely boxes from Il Papiro. The ones above are from the company's Florentine collection. I'm also quite fond of the Gregorian Chant boxes. 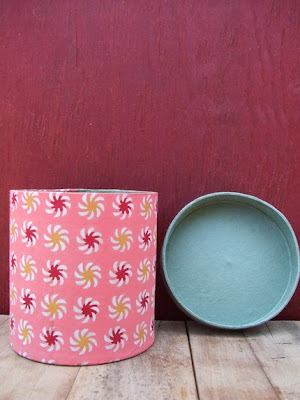 Over on Etsy, JaneBox has some lovely options, made with handprinted paper. Update on Oct. 7, 2012: I'm no longer finding these boxes at JaneBox. 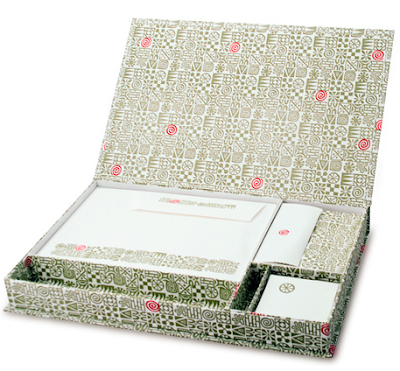 Or for those of you who still send snail mail letters sometimes, you could get a beautiful stationery box, like the ones from Brookfield Stationery. The boxes from Rossi are pretty wonderful, too. Do you really need to own things you rarely use? 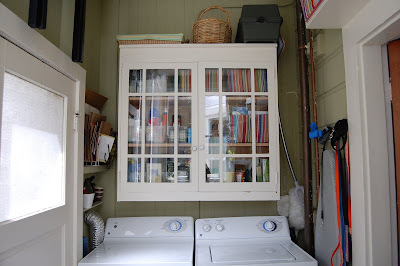 One way to have a less cluttered space is to borrow (or rent) those things you seldom need. - I borrow books and DVDs from my library - and some libraries also loan out tools, or cake pans. - I borrow books from friends and relatives - and lend my books to them. - My neighbor borrows my juicer (similar to this one); I borrowed her vacuum cleaner when mine was off being repaired. - I've seen people borrow crutches, wheelchairs, and ladders on Freecycle. I've also seen a group of moms in the San Francisco area lend out warm clothes to those making once-a-winter trips to the mountains. All sorts of things can be borrowed; besides the types of items already mentioned, there's camping equipment, costumes, electronics - and much more. Some people decide to go beyond casual one-off borrowing and create sharing groups: neighborhood groups, workplace groups, school groups, church groups, etc. In these groups, all the members identify things they are willing to lend - so everyone knows what's available. If you are considering going this route, you may want to buy - or borrow! - The Sharing Solution, published by Nolo Books. The book will walk you through questions to ask - like what happens if a borrowed item gets broken - so all members have a common understanding, and problems can be averted. Sample agreements are also provided, which you can use as a starting point. I'm a regular reader and love your blog posts. Can I ask for advice and feedback from you and your readers? I upgraded to a stacked washer and dryer a couple of months ago and lost a neat cabinet in the process. I put in Elfa shelving which did increase the storage capacity of this space quite a bit but it looks sloppy to me and it's not quite working. 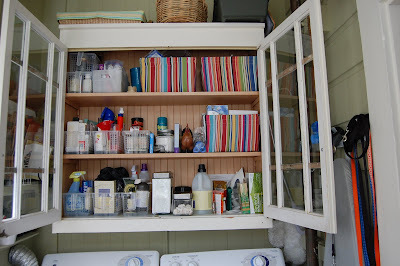 In the cabinet, I had little, handled bins sorting everything and they haven't made the transition to open shelving very well. After studying the Elfa laundry room set-ups on The Container Store website very carefully, I'm considering white Tribeca bins (two large ones side by side on the "messy" shelves (see shelf with blue paper towels and shelf with square basket) but want to keep the striped bins since they're working well and I think they're cute. 2. 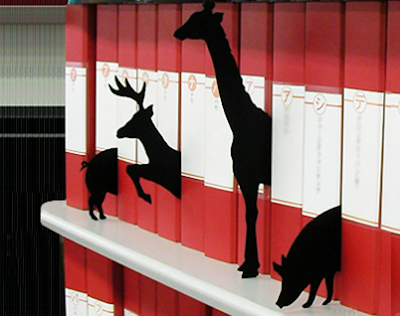 You might be happier with the Elfa solid shelving. (The Container Store will probably take back the ventilated shelving you currently have, too - they are great about returns/exchanges. When a client of mine bought a Elfa system, they specifically said he could bring it back after it was installed, if he didn't like it.) Or maybe it would help to use the shelf liners. 3. I love those handled bins you had - I just discovered them at The Container Store and used them extensively (in the white version) at a client of mine's. But this was inside a hall closet, not on Elfa shelves. 4. Those striped bins are nice - they are cute, they work, and you like them. I'd keep them. Who cares it your space looks just like TCS pictures? I'd be inclined to deal with the problem shelves first, and then see if anything more is needed. 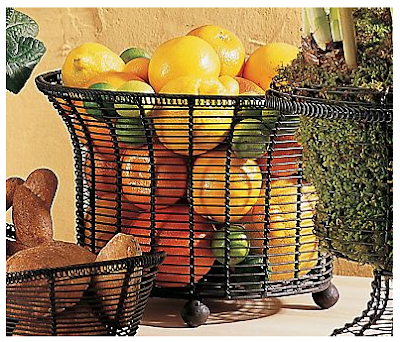 Those striped baskets could add a nice pop of color if most of the rest is clear or white. But then again, I'm into eclectic. Certainly, some other people would prefer the all-the-same look. 5. Obligatory organizer question: Do you really use and/or love everything you have in this space? 6. With your new set-up, it looks like it would be tough to get to the things on the non-ironing-board side wall - and the stuff on that wall really looks crammed in there. Are there any other places for that stuff? 7. You say "it isn't quite working" as well as you don't quite like the look. What specifically isn't working? Be sure to consider functionality as much as looks. 8. The size of the big blue bin seems out of proportion to the rest - it's not just that it's blue. Cynthia wrote back, and it seems #5 was the most useful comment, along with #8. A lot of things can actually get removed, giving her more of the look she wants, with "extra space around everything." Any other suggestions for Cynthia? I know I have a lot of organizers as readers; what might you recommend? 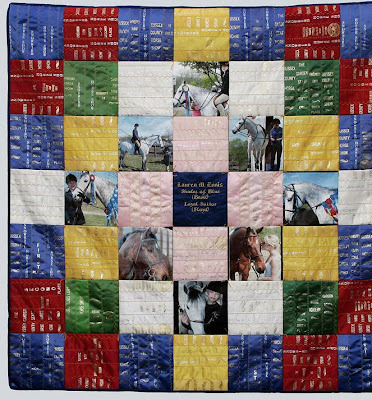 If you've been involved with horse shows and want to save at least some of those hard-earned ribbons, but aren't quite sure exactly what to do with them, a number of women have an answer for you: Get a quilt made. 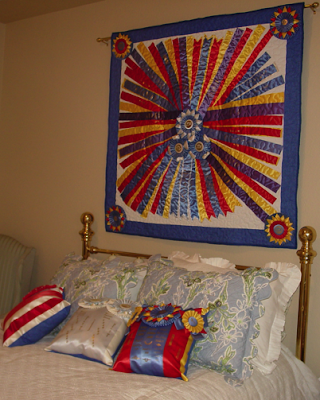 The quilt above comes from Sarah Boudreau of Ribbon Quilts. 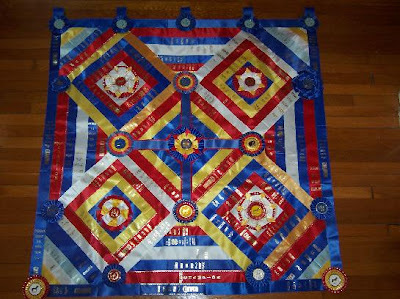 Sarah also makes quilts from dog and cat show ribbons. This is one of the many designs from Lani at Show Throws. This one comes from Distinctive Designs by Diana. 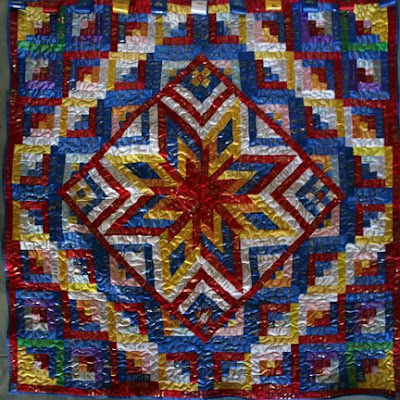 And finally, this one comes from Keepsake Ribbon Quilts. Gail makes pillows as well as quilts, as do many other of the quilt-makers. Here in California, it's illegal to use a cell phone while driving, unless you're using a hands-free set that doesn't cover both ears. But studies show that a driver's cell phone use is dangerous - hands-free or not. Governing points to a 2006 study that found no difference between drivers talking on hand-held phones and those talking on hands-free devices — as soon as people started talking, they became more likely to rear end another car than a legally drunk driver. More recently, researchers found that simply talking on a phone cuts the brain activity devoted to driving nearly 40 percent. The key element to driving safely is keeping your eyes and your mind on the road. Text messaging distracts any driver from that primary task. So the next time you’re tempted to text, tweet, e-mail, or otherwise type while driving, either ignore the urge or pull over. We don’t want you rear-ending us. Indeed, one poor guy has been rear-ended three times by drivers who were texting. And it's not just cell phones that present a problem. Eating while driving is also dangerous. And if you're a soccer fan, listening to a game on the radio while driving can also be a dangerous distraction. So as we all go about our busy lives, let's remember that those lives are precious - and be sure to drive safely, giving our driving our full attention. Have you posted about suitcase storage? Not yet, but here we go! Here are my thoughts. 1. If you have a small home, suitcase storage is likely to be a challenge. Suitcases can be stored in closets or under beds - or in garages, basements and attics if humidity, temperature and pests are not an issue. Be cautious with leather luggage, since leather does best at about 50 percent relative humidity and 60 to 70 degrees Fahrenheit, per Saving Stuff. And leather luggage should not be kept in direct sunlight for extended periods of time. If you travel lightly and have smaller pieces of luggage, storage will be easier than if you travel with large pieces. 2. The best answer will partly depend on how often you use your luggage. The once-a-year vacation traveler has different needs than the every-week business traveler, who will need the luggage to be conveniently located. 3. One standard trick is to nest the suitcases, one inside another; of course, this only works if your luggage is the right size. Other people use their stored luggage to hold out-of-season clothes, or anything else that's used infrequently. 4. 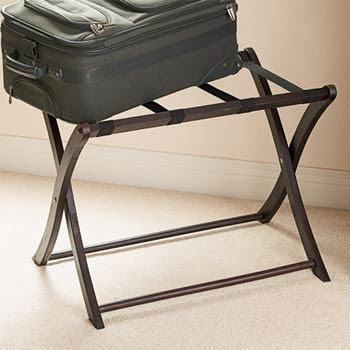 If you have the room, and you travel frequently, a folding luggage rack could be useful. 5. If you use the luggage infrequently, you could try this approach: Borrow or rent luggage when needed instead of owning it. As Talley Sue NYC writes, "My in-laws store their large suitcases in one another's houses." Her husband has a large extended family, and family members borrow suitcases from one another as needed. Flight 001 is currently doing luggage rental out of its New York store located in the West Village; the company doesn't promote the service on its web site, since it's a single-store service. 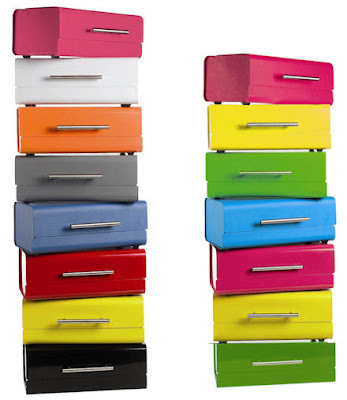 Reader Question: Brightly Colored Bankers Boxes? 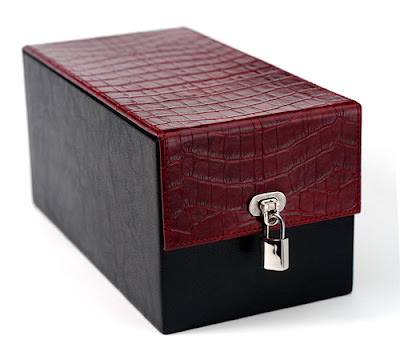 I was looking at your web site about bankers boxes, and wondered if you knew of a source for non-commercial looking boxes. I'm looking for some brightly colored ones, if they are available. I just put shelves in our bedroom closet (we have 9 foot ceilings, and all the upper space was going to waste) and I want to use bankers boxes to store "stuff" like sweaters and clothes that we only wear part of the year. My wife doesn't want it to look like office storage though. I had gone into The Container Store and asked about "bankers boxes" and the salesperson didn't know what a bankers box was. It turns out they have solid white ones, but no colored ones. 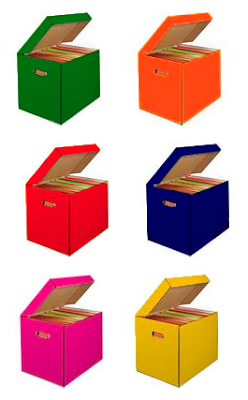 Well, there are a few colored bankers boxes available from Fellowes - they don't seem "brightly colored," though. There's one in red, and one in cornflower blue. Another product that's an exact match is the MeBox, which I've written about before, but Design Within Reach doesn't carry that product any more. There are other distributors listed, though, so hopefully you can still buy them, if not as easily. (Update on Oct. 24, 2012: It seems the MeBox is not available at this time.) 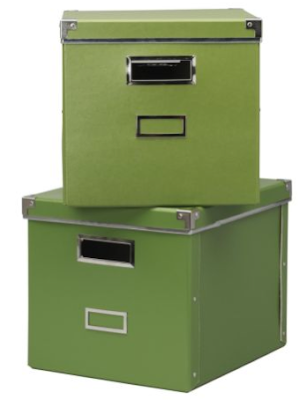 However, I did find some other storage boxes that are somewhat similar in size, and might work for you. 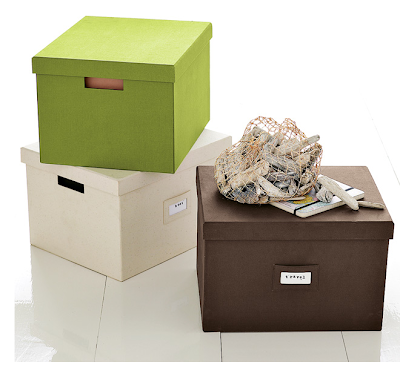 West Elm's canvas file boxes could possibly work. Update on July 15, 2011: West Elm no longer sells these boxes. 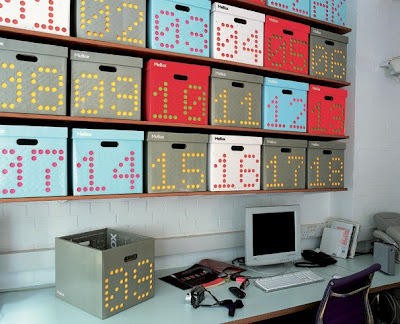 While IKEA stores drive me crazy, IKEA does have some boxes that could work. Here is the Kassett box; there's also Strikt. Update on Oct. 24, 2012: I'm no longer finding the Strikt boxes. Finally, these colorful cardboard boxes come from Kid-Eco the U.K., but it appears the company ships around the world. 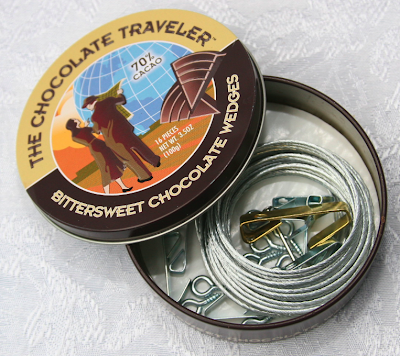 The boxes are available in a number of sizes. Kid-Eco calls them toy storage boxes, but there's no reason they couldn't store any number of things. 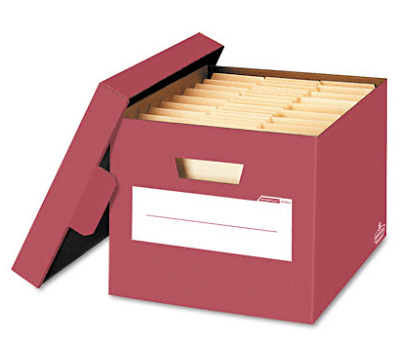 File cabinets are wonderful tools - but some folks work better with having their files more visible. If a desktop file isn't sufficient, you can look at file carts. 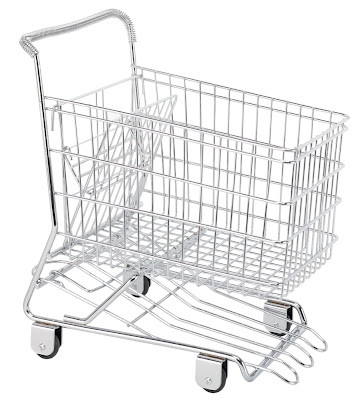 These carts aren't usually the prettiest things around, but they can sure be functional. 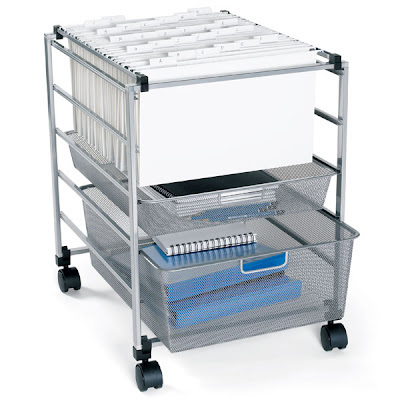 The cart shown above is a basic wire filing cart from Safco. 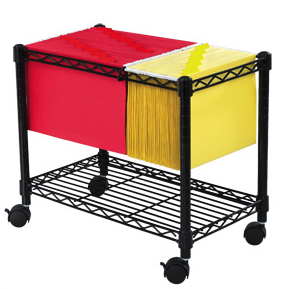 And here's a different style of wire file cart, also from Safco. The company also makes steel filing carts. 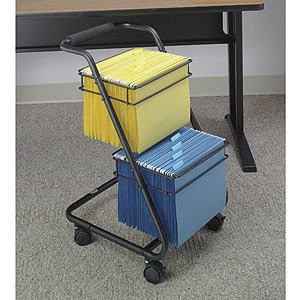 The Vertiflex Smartworx file cart provides another different look. 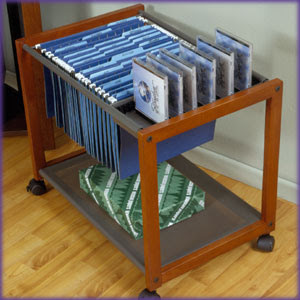 This file caddy comes from Sauder's Studio RTA line. Update on May 20, 2014: I'm no longer finding this product. And this is another Studio RTA file caddy. If you like elfa's mesh look, the elfa file cart might be right for you. And yet more file carts can be found from Smead and Rubbermaid. And if none of these are quite what you want, take a look at the products called mail carts. 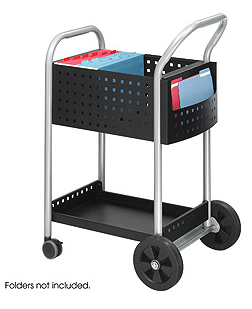 This is a Scoot mail cart from Safco - there's a larger size available, too. You could also check out the mail carts from Fellowes. Someone I know may be in the market for a bread box, so I've been inspired to take another look around at what's become available. 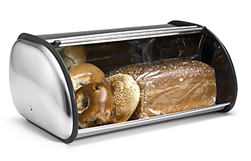 One thing I'm seeing is that companies whose bread boxes I've admired in the past have come out with new, interesting options. 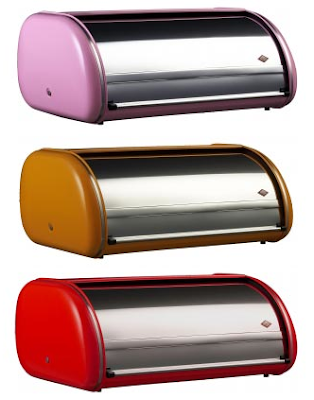 For example, the colorful bread boxes above come from Wesco. 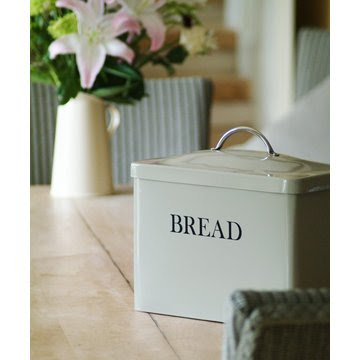 Polder has some bread bins with a similar look. Typhoon has some fun new options, too. 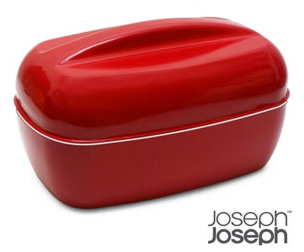 And RedCandy made me aware that Joseph Joseph now has a steel bread bin. 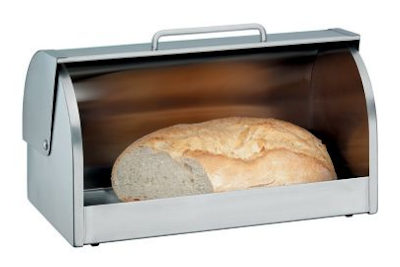 This large - and pricey - bread box is made by WMF, and is sold by Bloomingdales. 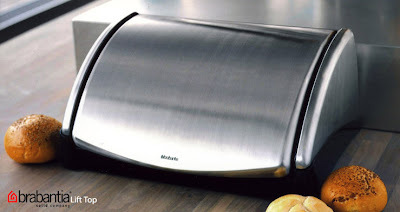 Don't like stainless steel? 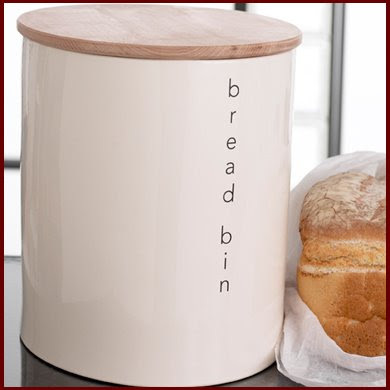 Here's a different approach to the bread bin. 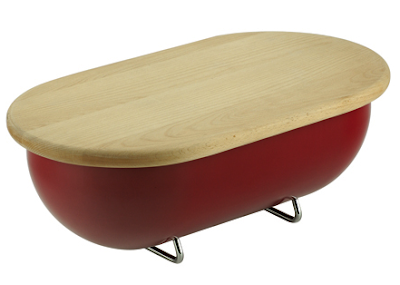 The wood for the lid of this porcelain bread bin can serve as a chopping board. 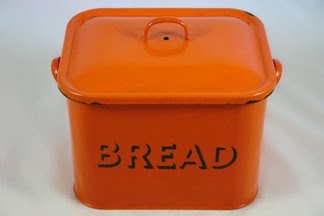 And if you really want eye-popping color, these may be the bread bins for you. Finally, H is for Home "specialises in the unusual, the quirky, one off, handmade and vintage" - so the bread bin I'm showing above may not be available in the future. However, there are six different bins available today - and who knows what interesting products might show up in the future. - If I'm taking a taxi, will it show up on time? - What will traffic be like? If I'm leaving from home, will there be a tie-up on one of the few roads out of my coastal town? - How long will the lines be at the airport? 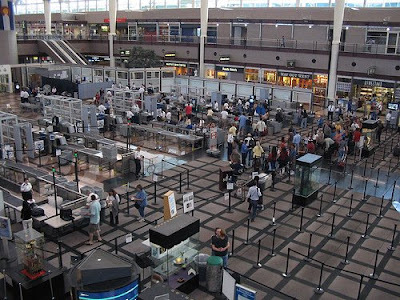 Will I be selected for a go-through-the-luggage security check? I find I'm just much less stressed if I leave for the airport with plenty of time to spare. At the San Francisco airport, I have my routines, which include a nice relaxed meal; we are blessed with some very nice dining options, especially in the international terminal. And the same thing applies to other appointments, although I don't leave quite as much slack time as with the airport. I leave extra time for getting lost (if I'm going someplace new - even though I rarely get lost), for finding parking (if I'm going to San Francisco), and for getting held up in traffic. When I don't leave early, and cut things too closely, I sit in my car fretting about every long light I hit; that's no fun! If always have something to read in the car with me, so if I arrive early, I can put the time to good use. 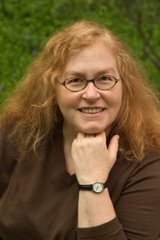 Organizer Janine Adams recently wrote about her new philosophy of arriving early. She said that "Stress vanished. It felt so good not to be rushed." To which I say, amen. The lovely basket above comes from Pierre Deux, and the store has a few other nice options, too. But if these aren't to your taste, there are many more to choose from. Update on Jan. 2, 2013: Pierre Deux has gone out of business. 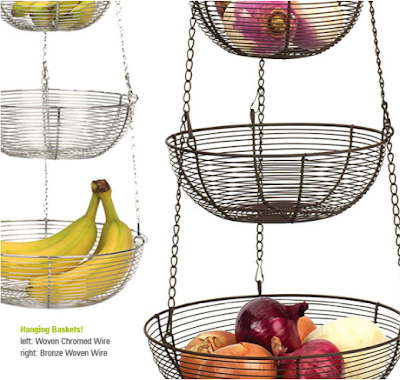 RSVP makes the classic hanging baskets - for fruit or numerous other things. 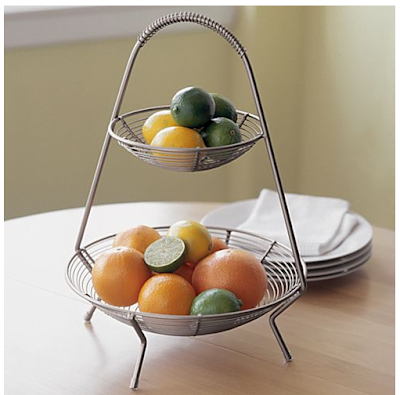 This nice two-tier fruit basket comes from Crate and Barrel. 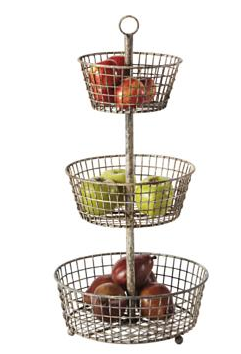 Smith & Hawken also sells a tiered wire basket. Update on July 10, 2009: Smith & Hawken is going out of business, and is no longer taking internet orders - so the original link to this product no longer works. You may still be able to buy products at the stores. 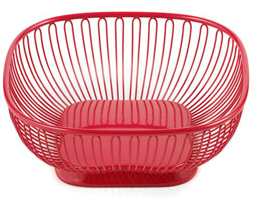 This basket comes from Blomus. 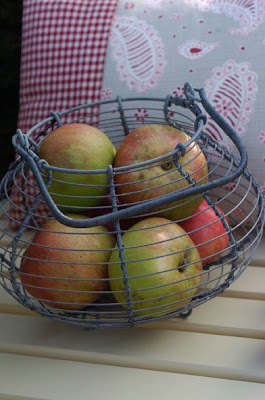 This lovely wire fruit/egg basket comes from Moorhouse Trading. 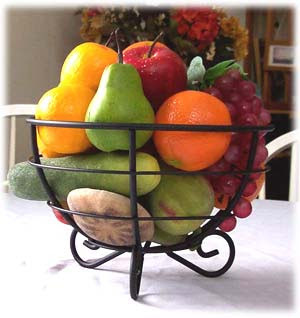 Metal workers have also created some very nice fruit baskets. This one comes from Maine Iron Works. 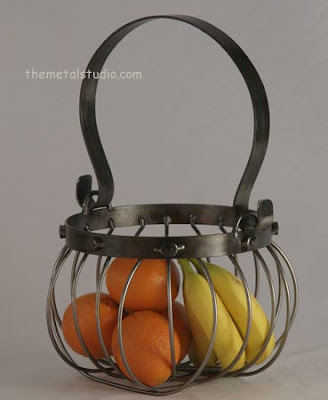 And this fruit basket comes from the Metal Studio. 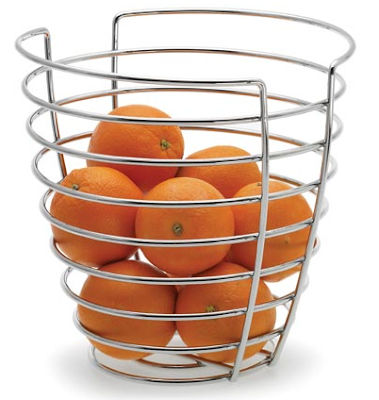 And finally, because I'm a sucker for certain kinds of cute, I'll leave you with this fruit basket, sold by Dwell.